The perfect nursery - A haven for sleepless nights, endless cuddles, story-time and making memories. I thought long and hard about how to create what I thought was the perfect nursery. When child 2 came along, I used the template from the first nursery to create a second one. Saved me a lot of time (which we all know is sacred once children come along). 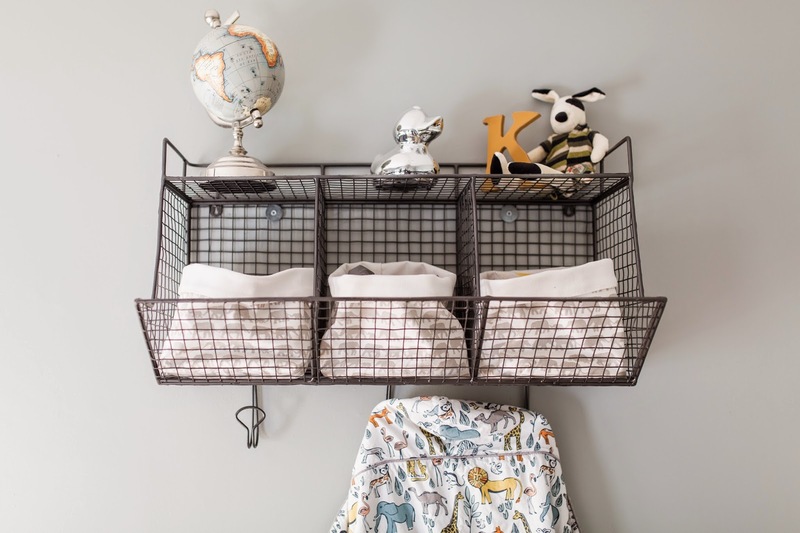 So here it is...the essentials for the perfect functional nursery. Colour and theme. You will need to decide on a colour palette and overall theme. This is the perfect place to start your planning. Crib and mattress- you don't need to spend an arm and a leg on a crib. We purchased a simple inexpensive crib from ikea and it is just perfect. We didn't bother with fancy bedding...a simple crib sheet is all you need to keep the room looking modern and clean. 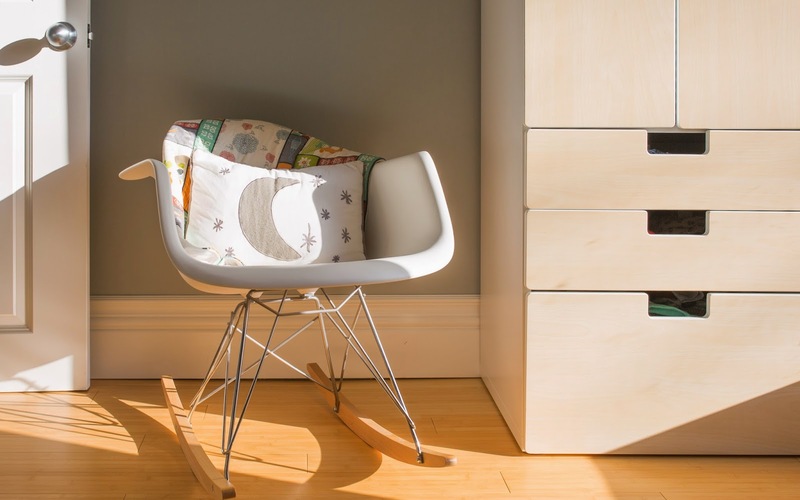 Change table- a long dresser is definitely preferable since it can be used long past the baby stage. Just secure a change pad on top and you are good to go. Place a cute basket beside the change pad to store diaper essentials. 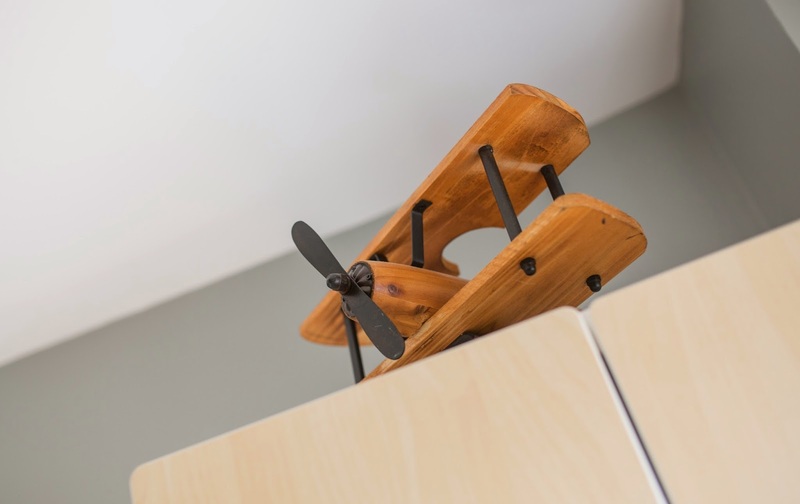 Shelf with hooks- so useful over the change table to hang up towels/clothing, for storage or as a display shelf. Keep fragile/important display items out of reach on high shelves. Nursing chair- the size of the chair totally depends on how much space you have to work with. Our rooms are pretty tiny so we decided on a small modern rocking chair. Plus this chair can be used in other living spaces once it is no longer needed in the nursery. Toss on a cute accent pillow/throw that matches the theme of the room! Ottoman- use for resting tired feet or as additional seating space. Floor poufs are especially adorable. Standing wardrobe - useful if there is no closet in the room. Rug- A small rug really ties the room together and makes it warm and cozy. Throw in front of the crib or change table. Sheepskin rugs are really popular and make the room super cozy! Accent/decor wall- match to theme of room. You can get really creative here: decorative wallpaper, painted stripes, decals...skies the limit! World map decal for traveling theme nursery room! 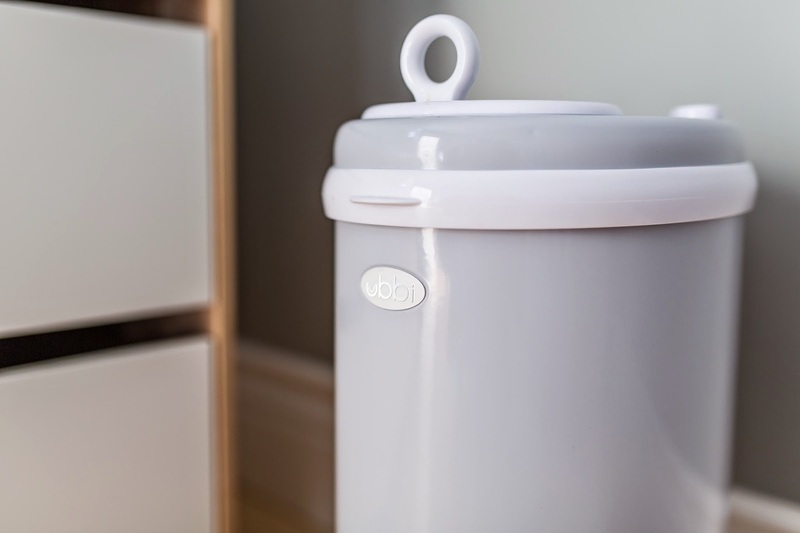 Diaper pail- I personally love my ubbi. It isn't cheap but you save in the long run by being able to use your own bags. It also comes in different stylish colours so you can coordinate it with your room. I love that it is made of steel and keeps smelly odours sealed away. 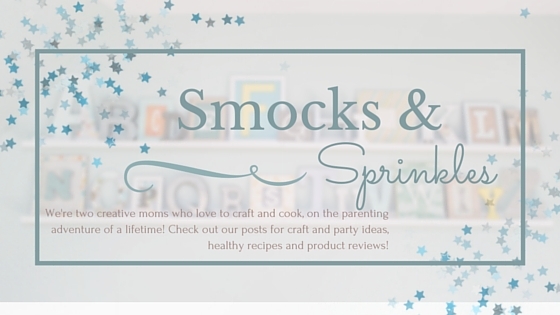 Can be used for disposable or cloth diapers! Black out blinds or curtains- necessary to help baby sleep better! Ceiling mobile- to be hung over the crib or nursery chair. I have seen everything from traditional mobiles to lanterns and tissue balls. Just match to the theme of your room. 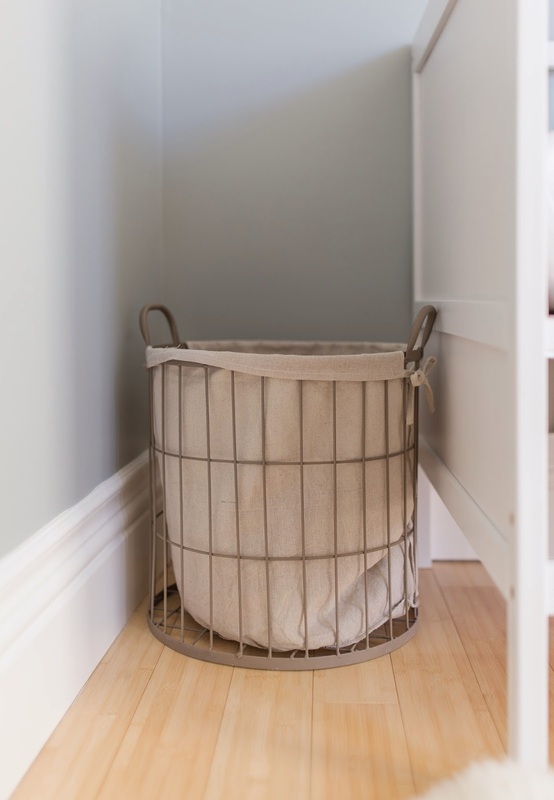 Laundry hamper- home sense sells awesome hampers at a great price! 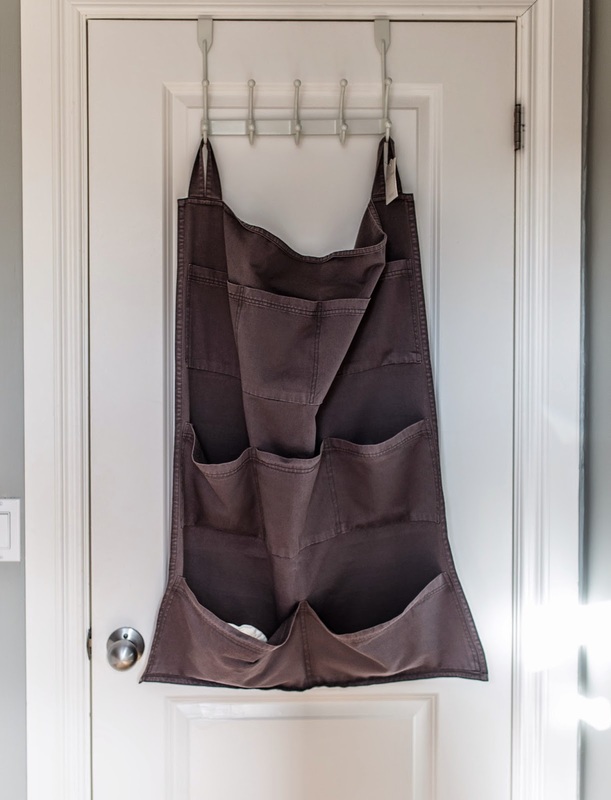 Add extra storage easily with an over the door organizer! Storage baskets are great for hiding clutter and organizing toys. Other important items- video monitor, humidifier, white noise machine, lamp. 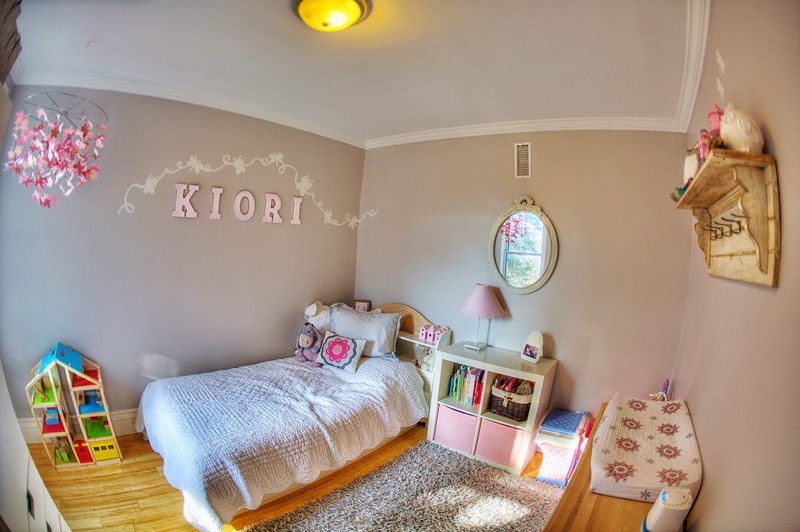 Kiori's room is very feminine and airy with gray and light pink hues. Her name was spelled out with painted wooden letters and framed with butterfly decals. This made up the accent wall. A mobile with paper butterflies was hung from the ceiling. 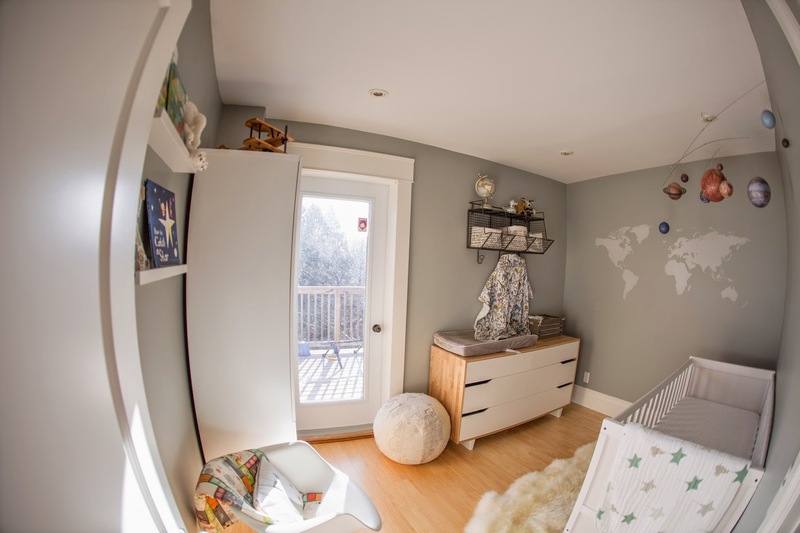 Kian's room is clean and modern with a travelling/exploration theme in gray, orange and blue. 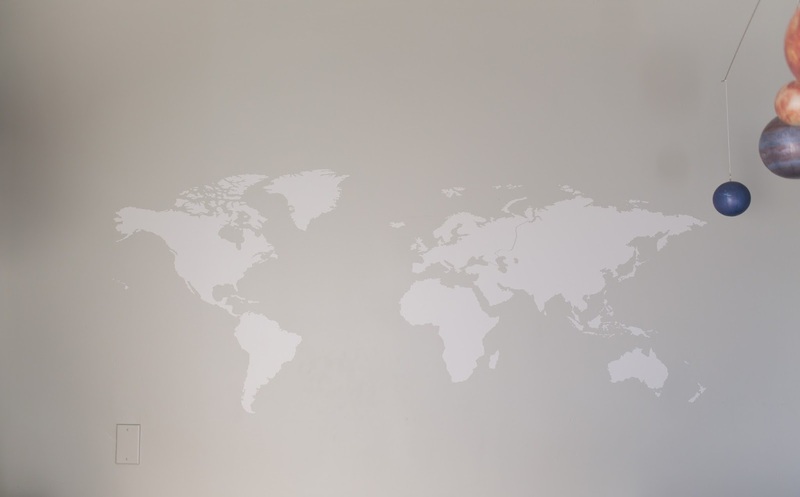 A world map decal in a lighter shade of gray was used to create the accent wall. 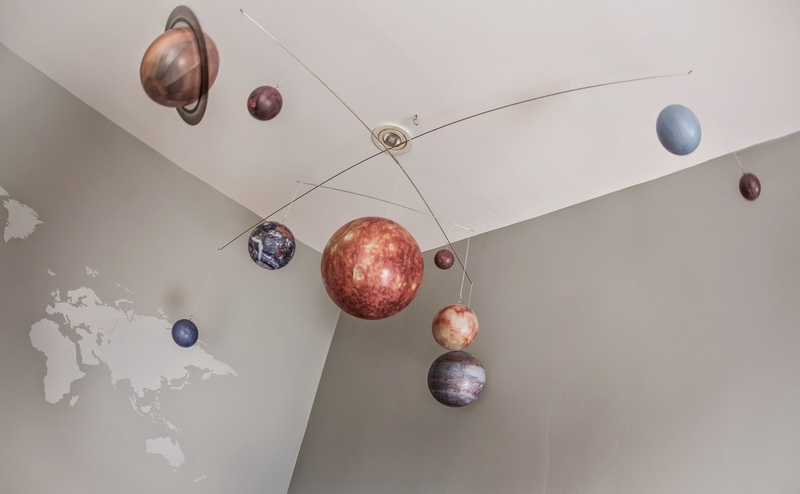 A solar system mobile, wooden airplane and world globe complete the look. Tip! Gray provides a clean and modern background for any room. It's also gender neutral and goes well with any colour. Tip! 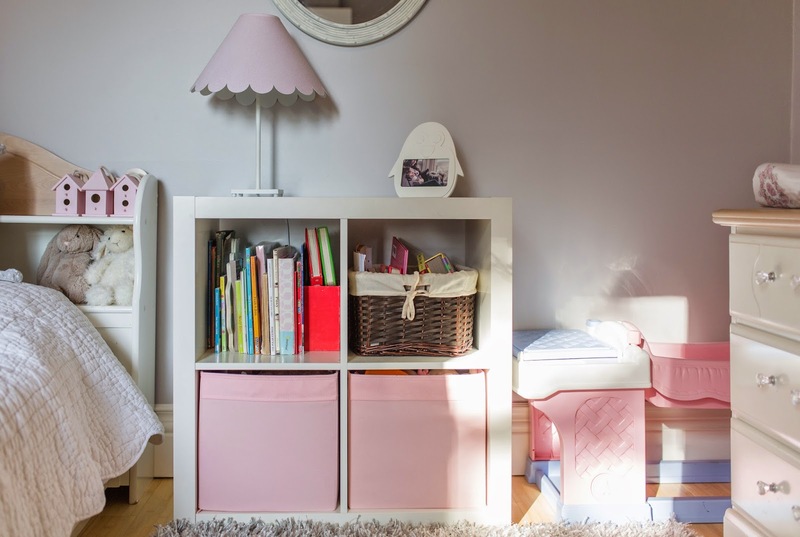 Create a nursery room that you can easily transition into a kids room. This can be accomplished by avoiding "babyish" themes/decor (ie. baby disney characters). Picture a bed in the room in place of the crib. That's all you should really have to swap when it's time for the big change. To help you design the perfect nursery for your little one, we've created a checklist with the items listed above! 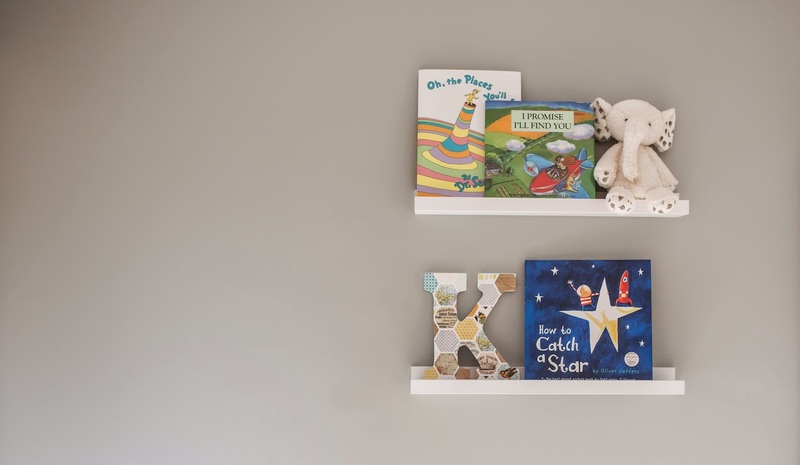 How did you design your nursery? What elements did you include, and what was your theme?